I’m not the type of girl that has enough freezer space (or the inclination) to store all my vegetable odds and ends and then remembers to boil them down into a broth and then re-store that broth in the freezer. Enter: awesome stock powder that almost tastes like chicken stock (gasp!) I first read about stock powder in a vegan cookbook (can’t even remember which one). I didn’t think much of it at the time. Then Holly at My Plant Based Family did a post on it and I ran to my kitchen and made changes with some Vedged Out flair. Here’s my rendition. Made hearty by the addition of dried shitake mushrooms, sun dried tomatoes, more dried herbs and stuff like that. 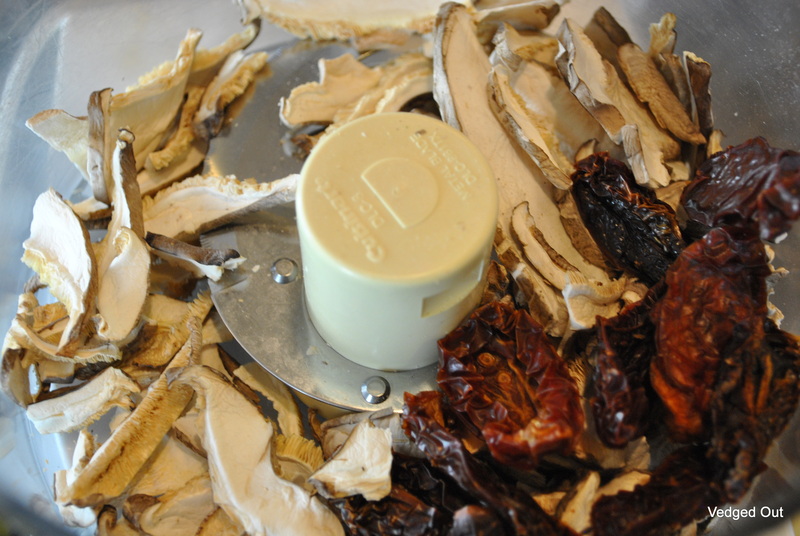 Method: In a food processor, process the shitake mushrooms and sun dried tomatoes until they are very fine. Add all other ingredients. Process for a few minutes more. Just made this in my Blendtec instead of the food processor after reading Annie’s comment below. I highly recommend using a high powered blender instead of the food processor if you own one. Just dumped everything in the Blendtec and ran it through a couple of cycles on a 10. The result was a powder as fine as cornstarch with none of the graininess that I had experienced with the food processor. The powder stuck to the jar like crazy, so I emptied it out as best as I could, then added a quart of water and whizzed it all up to clean the jar. Viola. A quart of stock in my fridge for dinner tonight. This stock powder stores perfectly in a pint jar in the pantry. Use 1 T. stock powder per cup of liquid in your recipes. If you don’t have the dried mushrooms and tomatoes on hand, this recipe is still good without, it just won’t have as much depth. If you can’t be bothered to make this than at least buy this delicious veggie stock base and stop wasting un-recycleable tetra-paks. Thanks to all of you for all the love this last week and for helping me get my blogging mojo back. Thanks! I think I’m *mostly* back, this post had been hanging out in the draft archives for a while and needed to come out! Had you gone too AWOL, you know we’d have badgered you more 😉 Love how all of us got so inspired by Holly’s broth mix. It is good stuff. Especially with the ‘shrooms! Such a cool idea! Might give this a go as ive nearly run outta stock powder, tastes kinda like chicken stock you say? there’s lotsa hearty cooking to be done if that’s the case! I think you’ll love it. Feel free to play with the herbs you put in it and use the ones that suit the way you cook. I think it’s a nice replacement, vegan stock powder is expensive and usually loaded with oils and or artificial stuff. I wish it were easier/cheaper to buy vegan stock powder here. You have to go to a health food store to get it, then you pay an arm and a leg for it. I do like that this is customized! Fran, you are such a dear! Overseas postage costs a fortune even for small packages so while I appreciate your offer, I’ll politely decline and make an Aussie family member bring me ecco, vegemite and all 3 flavors of the Massel stock powder next time they come for a visit! xoxo p.s. I’m sure Bryanna will be honored to use one of Steve’s spoons! I’ve never made stock powder before – to tell you the truth, it never occurred to me. What a good idea for when the frozen liquid stock runs out. If I had a chest freezer, I’d probably be more inclined to make the liquid stock, but I just have no room to store it 😉 It didn’t even seem like a very good idea to me the first time I read about it, but back then, I didn’t really know what nutritional yeast was. You are a real genius, you!!! What a great & tasty idea! Friday, I am going to receive my new Kenwood food processor & this will be the 1st recipe I will make with it! Stock power!! yes!! This is perfect. It will take up so much less room than my liquid veggie stock. This is brilliant! I’m going to make it as soon as I get home from work! Thanks! Enjoy! It’s fun putting together. I enjoy it so much that I even just use it as a veggie broth when I’m sick. A very handy and tasty idea! Ooooh do you rock! I hate buying bouillion at the store – so expensive and the meatless options are few and far between. This is awesome. Thank you! Haha! The real credit goes to Holly, but it’s too good of an idea not to be shared. I struggle with the same issue at the store when it comes to stock. I still buy the jarred kind on occasion, but I can’t get it easily and this is made of stuff I all ready have in my pantry. I made slow cooker freezer bouillon cubes once. I didn’t like how it turned out You probably had a better recipe! However, I do hope you like this, I think it’s very handy! This is brilliant and I have all of these ingredients! You go girl! Yay! That’s what makes it great for me, that I always have these ingredients on hand. If I’m missing something, it’s easy to sub something else or just leave it out. Isn’t it delish? This is definitely a different flavor profile, but not in a bad way. I wanna re-create that jarred base, but haven’t figured it out yet. I wonder if you would juice the veggies on the ingredient list, then boil them down til thick to make the concentrate?…. Well I don’t know, but if anyone will figure this out, my money is on you. And when you do, I know you’ll post it. Do I see a cook-book in your future? Maybe someday! Actually have to be creating things to come up with a cookbook, which I’m not at the moment, but hey, that’ll change sometime soon I’m sure. That just has to be made . . . Thanks for the recipe . . .
Go to it! 🙂 Enjoy! This looks awesome!! Thanks so much for this post!! I bet it is much cheaper than buying pre-made also! And perfect for when you don’t have the pre-made stuff in the house! Thanks Danielle! I do think it’s much cheaper than store bought powder, especially since most people all ready have most of the ingredients in their spice cupboard. 🙂 Not to mention the tetra paks that can be saved with something like this. Somer I just made another batch yesterday! It was long overdue. I tried your method last time using dried mushrooms and sun dried tomatoes but I don’t have a high powered blender so I was left with chuncks and rehydrated. Yesterday I just stuck to my original blend in the food processor. It works best for us. I only have a small freezer too and don’t have room for frozen stock. This is just too easy not to do it! Love ya Somer! Haha! Yeah, the chunks wouldn’t quite make for a very nice stock. Thanks so much for sharing this on your blog. I love how it inspired both Sarah and I to get it going! I’m out of the dried mushrooms at the moment and have no inclination of going to the store, so sometimes I make it without too. Love you right back. Love this stuff! I’m running low and need to fire up the food processor. Maybe Kel and I are a little weird, but we like this straight up, stirred into a mug of hot water. Then I’m a weirdo too! I only wish I could figure out how to grind it down even finer, I’ve done batches in my coffee grinder before, but it’s too much work! That would take an eternity! 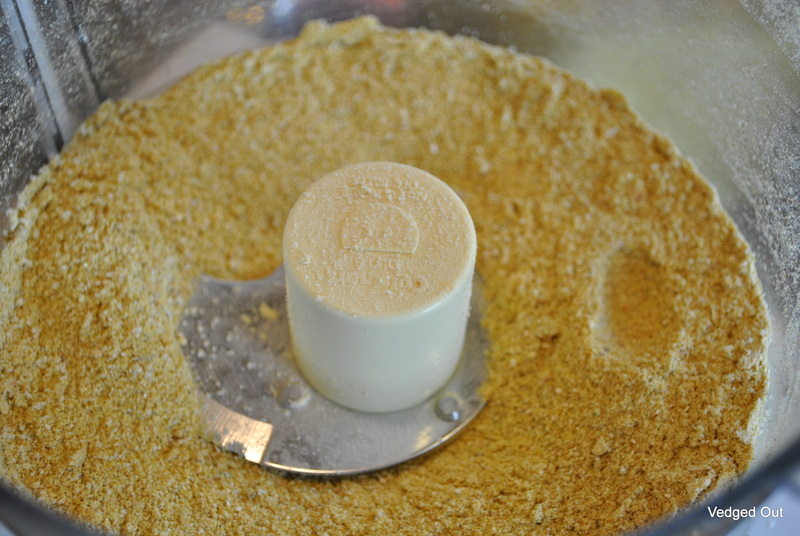 I can get mine nice and powdery – – maybe you need a Vitamix ;-)! Welcome back Somer. this is a super idea! I love pantry food, and we use plenty of veggie stock cubes around here. We *do* make stock from veggie peels and it is sooooo good. But messy and labor intense. If we had a large second freezer, maybe fresh stock would more realistic. (First, we would need a bigger house for that freezer! :). So this is perfect. Can’t wait to try it. Hope you are feeling much better. I’d say winter is a better time to heal…in summer, spring, fall the desire to be outside is overwhelming…. Rest up and happy to see u online! Thanks Rissa! I wish I had the space too as I’m sure the flavor is unparalleled, but I go through at least a quart of stock on most days. 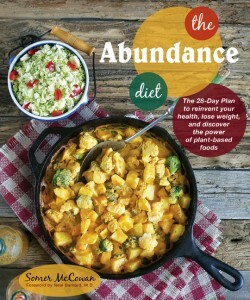 I would need a mammoth sized freezer and lots of time to do the homemade variety with veggie scraps. I’ve got more movement back, but still taking it easy. Thanks girl! Great to see you back ont he blog.. hope you are feeling better everyday! i never remember to store stuff, so we have to finish up the things on the weekends:) i gave my food processor away.. blendtec it is! this stock sounds like a great option to keep around for soups/stews for sure. Still down, but I got tired of reading. Sigh. Pulled this post from my draft archives. Yup, you need to do this in your blendtec and I’m sure you’ll add your own flair! awesome! Can’t wait to make this!!!!! What a great idea. And no MSG!!!! What a fantastic idea! I assume it can be used like bullion? Precisely! Just use 1 tablespoon per cup of liquid (you use more since it’s not compressed like a bullion cube). Welcome back, Somer! What a useful post! I always have ideas of being one of those people who has a scrap bag of vegetable odds and ends, but truth be told, I don’t especially want to add another task to my life. I do plenty of cooking from scratch as it is, and sometimes it’s nice to have things streamlined a little! This stock powder sounds like just the solution, and it’s still totally healthy. Thanks! However, I can be ‘this’ kind of girl. This is do-able! Thanks. Oh my WOW, Somer! This is awesome and I love the idea of not having to lug big bottles/cartons of store-bought stock home anymore! YUMMO! This looks amazing Somer, why bother cooking bones for 6 hours when you can use this! Precisely! Especially for us vegans who wouldn’t touch a bone with a 10 foot pole 😉 ! OMG you are brilliant- this is the most amazing thing since sliced bread – seriously, I would have never thought it possible to make this at home and it is SO EASY! Let me know what you think! I’d love to know what others think to put in it or if it can be improved! This seems way better than buying those expensive bouillon cubes, too! Pingback: “Mexican” Quinoa in the rice cooker? Yes. | Good. Clean. Food. Just mixed up a batch. The dry mix tasted awesome and now I am drinking a cup of the broth. Delish! I love the touch of cayenne. I did cut the salt in half and I think it still tastes great. Figured I can add more at the end of a recipe if needed but don’t think I will have too. I am eager to try some of your other recipes. I will never by expensive vegan broth again. Thank you for taking the time to share this. God bless. This is very delicious! I’ve been looking for a recipe for vegan granulated stock, as most of the UK stock cubes, powder and bouillon contain palm oil. I made this today and it’s really good. 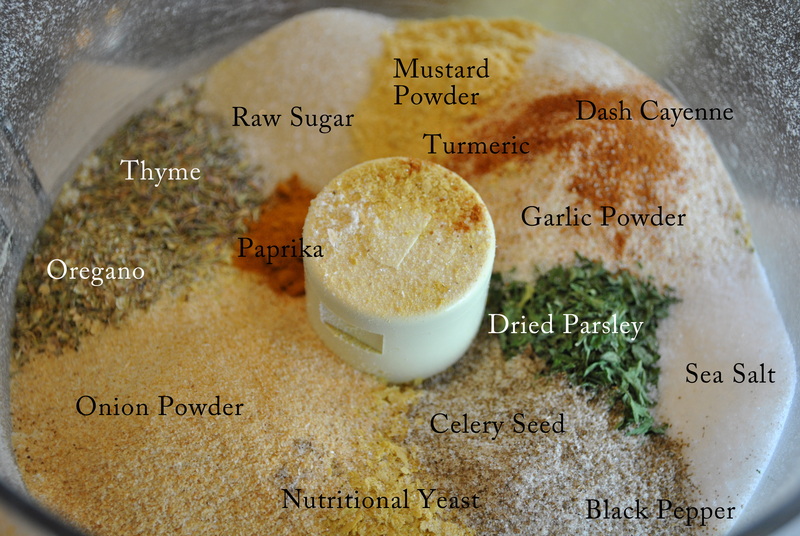 I’m in the process of making some soup and used this stock powder, and it tastes great! I’m going to use it as a base for my mushroom gravy that I have for Christmas dinner. I asked some non-vegan family members to try it, and they also liked it. Thanks for sharing this recipe. I have used this recipe several times. It is delicious. Thank you so much for sharing with us. It is great to have on hand. I have stopped buying stock, bouillon and powder. I can control the salt and am always sure it is gluten free. I have used it for stock, seasoning and gravy. Very multipurpose. Bless you. I have a question. The sun dried tomatoes I got are somewhat moist. They are not packed in oil or in a liquid, but were packaged in a plastic bag and have the consistency of fruit leather. It seems that if I blend these up with the dry ingredients they would moisten the whole batch and the stock would tend to spoil faster? Should I dehydrate the tomatoes until they are completely dry? This looks like an awesome recipe and I am anxious to make it! Thanks! that seems totally normal! Unless they smell off, go ahead and use them. Hi, I just made this for the first time while cooking up a batch of grains and it’s was so delicious that I used it as a seasoning-topping for the just-finished quinoa. Delicious. As much as I like Better Than Bouillion, I prefer making stuff myself, reducing packaging, and being in charge of healthy ingredients. Thank you! Hi, one quick question… does the large T mean tablespoon and the small t mean teaspoon?